STRAW - MILLER SAND & LANDSCAPE SUPPLY NEED A LITTLE...OR A LOT? Long leaf pine straw & wheat straw available every day! Rolled long leaf pine straw. 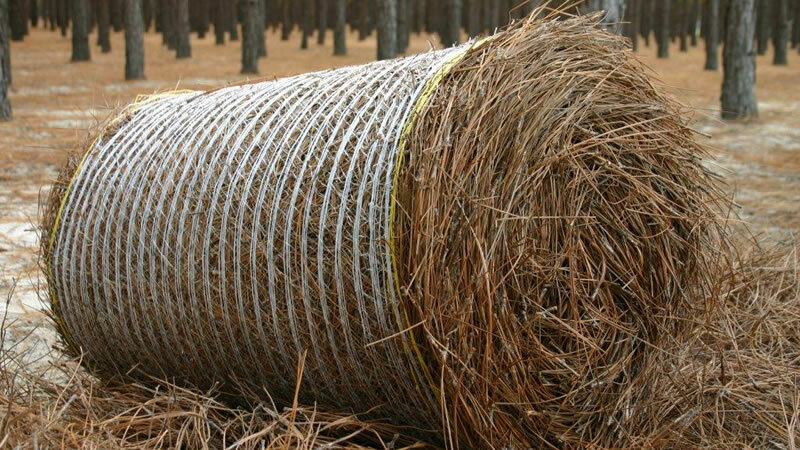 Our long leaf pine straw rolls are top quality & as clean as it gets. Each roll covers 120-150 sq ft, depending on your thickness preferences. Pine straw is an excellent mulch alternative & provides a professional finish to any landscaping. Use around trees, in flower beds, & anywhere else as the perfect ground cover. Our pine straw rolls are sold individually and available year round! Colored rolls have been washed twice & dyed red for superior color in a natural straw. For long lasting color & a bright, bold finish, you'll love our colored pine straw rolls! Wheat straw bales are perfect for mulching grass seed, providing warmth to outdoor animals, and decorating--so many options! Reasonably priced and available every day at Miller Sand!